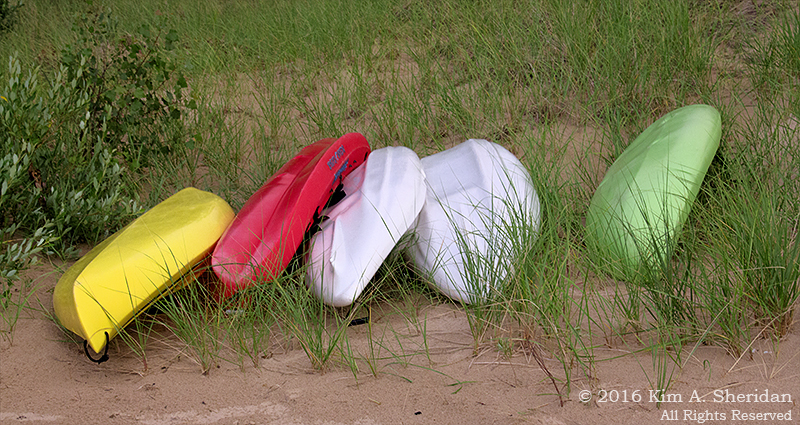 I learned to kayak in Michigan. Faced with deceptively strong one-foot waves and starting to veer dangerously sideways, I did just what she said. One stroke. Hmm, this odd paddle has a blade on the other end too. Let’s try that one. Two strokes. Then three, four, five strokes, and without knowing it I was out beyond the waves, maneuvering the boat like I’d been born to it. Flash forward five years, and once again I found myself in Michigan, this time with a lot more kayak experience under my belt. 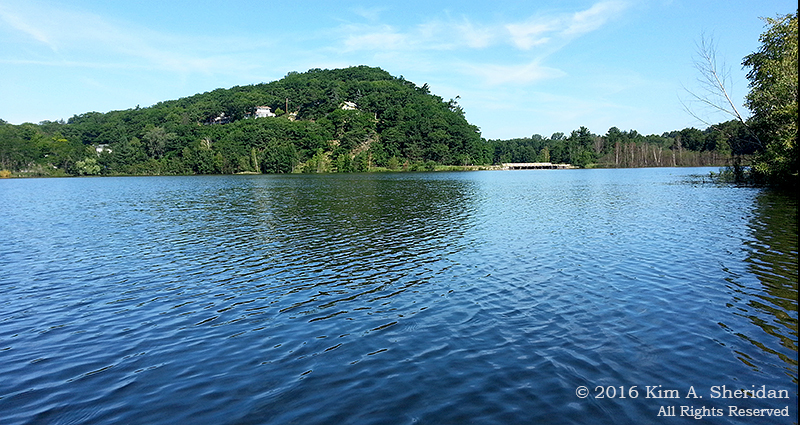 I’ve paddled ponds, lakes, creeks and rivers in Pennsylvania and New Jersey, both with companions and alone. Heck, I even own my own kayak now. 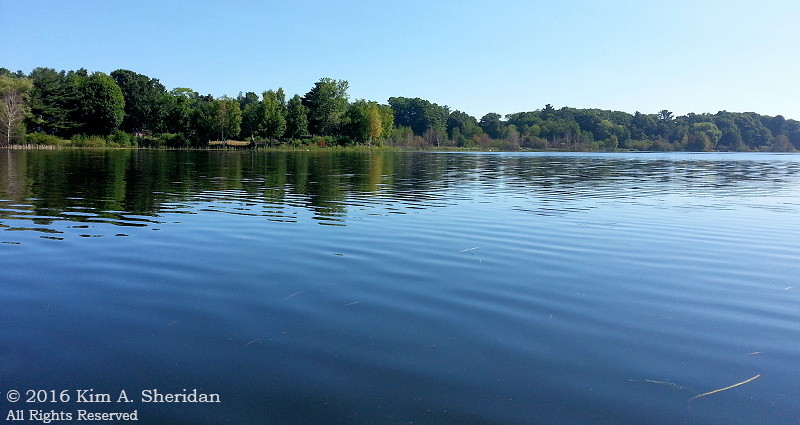 But until this year, my Michigan paddling had been lake-bound: Lost Lake and Hamlin Lake, Lake Michigan. No more. This year, I finally got out on a Michigan river. Two of them, in fact! Up first, the Lincoln River. 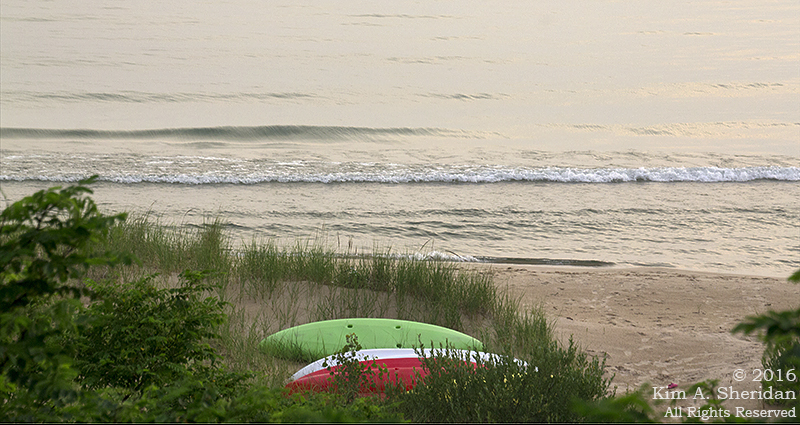 Getting there required a 1½ mile paddle north on Lake Michigan. During which time I realized that I’d left my waterproof point-and-shoot camera behind. Phooey. I’d tried this trip the year before, but had been turned back by wind and powerful longshore currents. Don’t the clear skies and crystal aquamarine water of this photo from last year fool you. 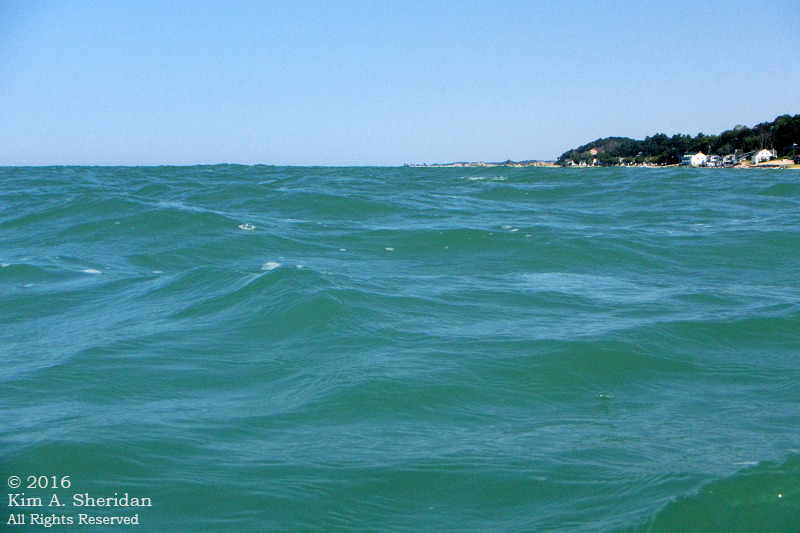 Lake Michigan is not to be trifled with. Underneath that rippled surface was a northward flow as unyielding as any spring tide. No such drama from the lake this time! This year she was a lamb, lying calm and blue under sunny skies. The trip to the mouth of the Lincoln River took a mere fifteen minutes. Once there, I sought the shelter of some trees. It was getting hot, and the shade was welcome. Another happy fifteen minutes took me under a footbridge and into Lincoln Lake. Finally I gave in and dug my cell phone out to take photos. I own two DLSR cameras, four lenses and a waterproof camera, and there I was, using a phone camera. Looking back toward Epworth Heights. My great-grandfather built a house in this Methodist resort a century ago, and my dad and his cousin Sherry spent summers there throughout their boyhoods. I grew up with Dad’s tales of Michigan, and fell in love the first time I set foot in the state. Must be in the blood. Tranquil scene along the Lincoln River. I spotted several Great Blue Herons, a couple of Belted Kingfishers and numerous turtles along the shores of white pine, hemlock and birch. 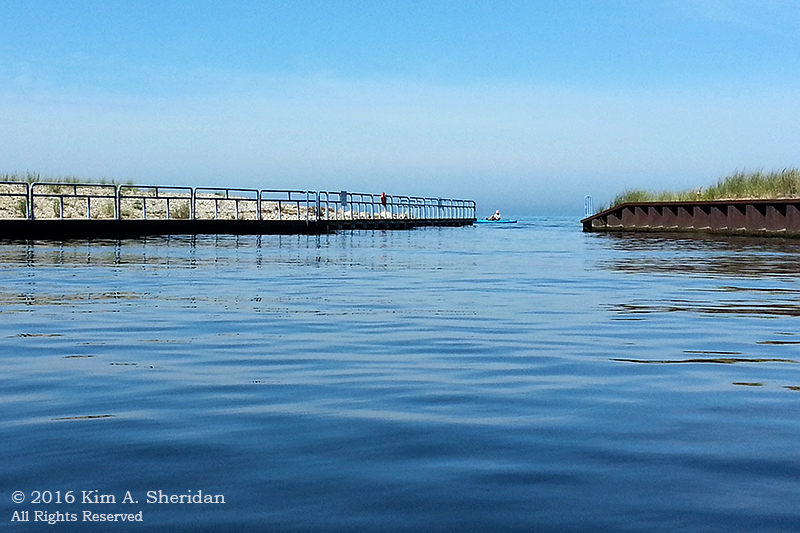 The mouth of the river, with Lake Michigan beyond. A nice day for a paddle, no? An even bigger adventure awaited a few days later. My cousin Becky, her husband Ron and their friend Mark invited me to go on a day-long canoe trip on the Pere Marquette River. 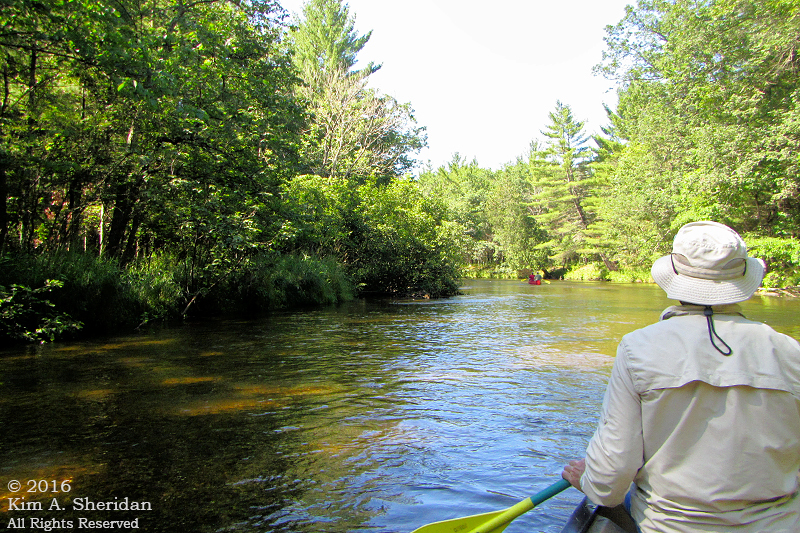 Looking over partner Mark’s shoulder, Becky and Ron in the red canoe about to slip around the bend. Canoeing! I’d lived in canoes as a teenager – I’d paddled, floated, talked, sang, ate and even slept in them. This was familiar as coming back home. And yet, not so familiar. The rust showed. I was surprised at how awkward canoeing felt. I had always paddled in the stern of a canoe when I was young, so that’s where I asked to be. Poor Mark gamely put up with my out-of-practice (and very different) paddling style for the day. He was generous with his tips and I learned a few things from him. I definitely wasn’t the veteran canoer I used to be. 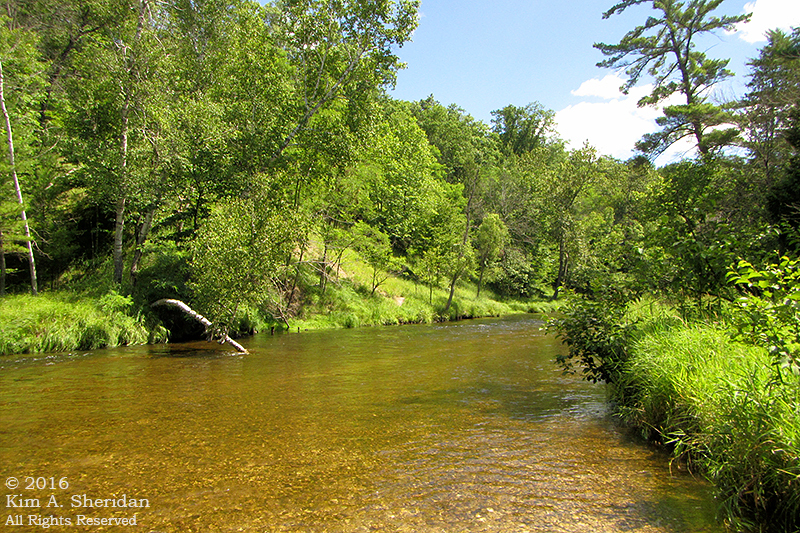 Our lunch spot along the Pere Marquette River. 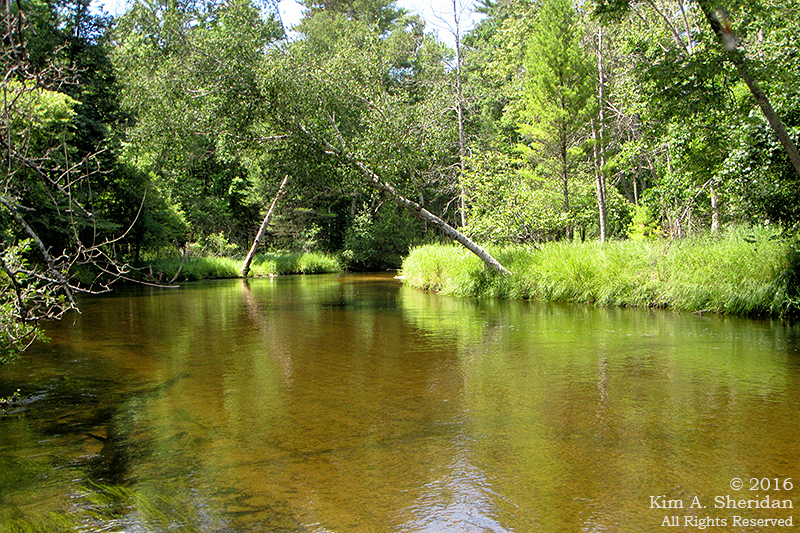 The river is lined with white pine, birch, cedar and beech trees, along with wild rice plants. Tiny damselflies were everywhere. We passed a white-tailed deer and her fawn, and two wood ducks, and were in turn passed by a Belted Kingfisher. 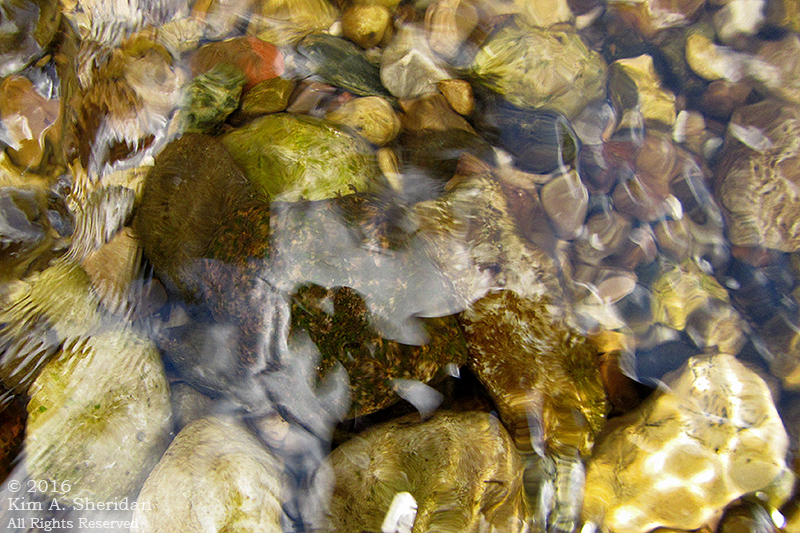 After lunch I amused myself looking at the pebbly riverbed. I think there might have been small fossils embedded in at least one of these rocks. Then I remembered my camera is waterproof. I’ve always wanted to try an above-the-water/ below-the-water split shot. 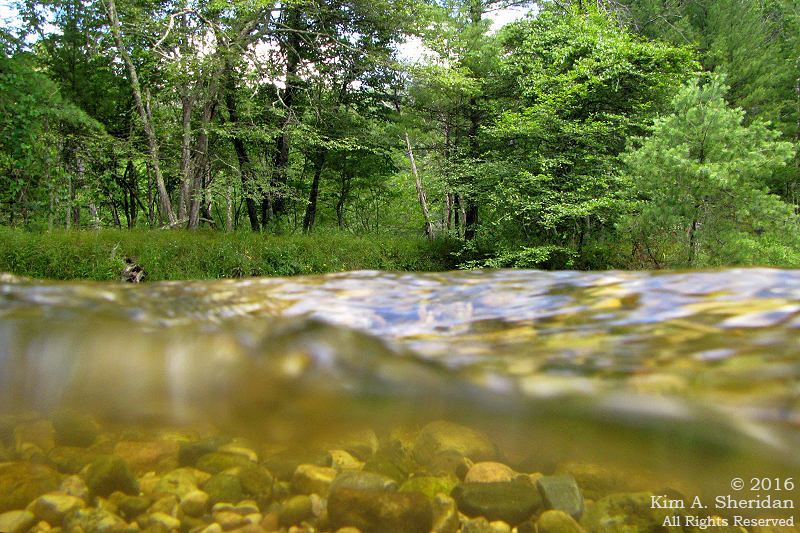 The rapidly moving water makes for an unusual boundary. When we got back on the river after lunch, Mark took over in the stern. I spent the rest of the trip wondering where to put my feet. There is NO space in the front of a canoe. Now I am quite sure that I’ve never paddled in the bow before in my life. 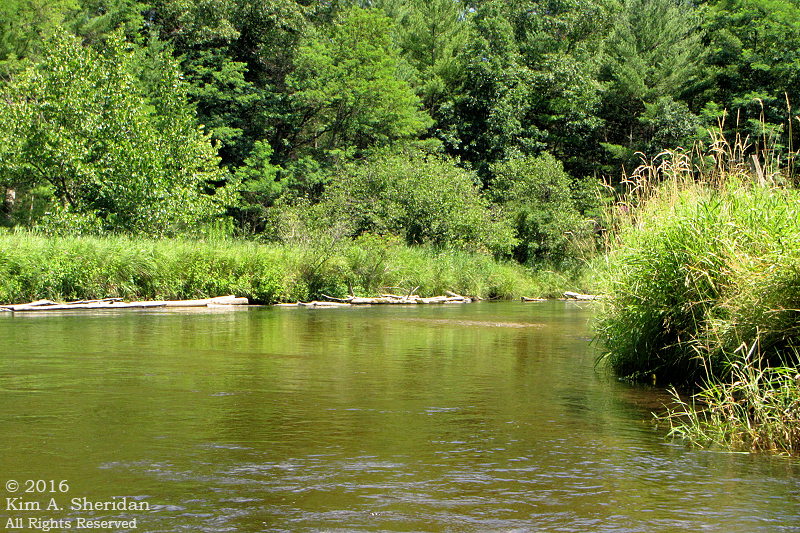 …And sit back and soak in a beautiful day paddling on a wild Michigan river. 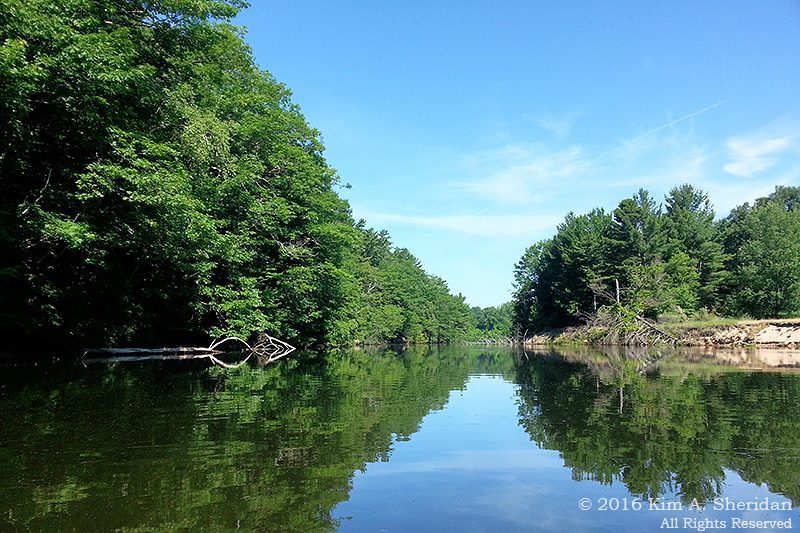 This entry was posted in Michigan, Nature and tagged Canoeing, Kayaking, Lincoln River, Michigan, Pere Marquette River by Kim. Bookmark the permalink.